How to keep your ‘Christmas Tree’ Happy!!!! 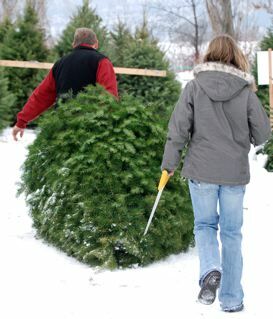 Keep tree in a sheltered unheated area away from sun and wind. Before bringing it in, make a fresh cut across the base of the stump (1/4” - 1/2" up from the original cut). After making the fresh cut, make certain you have the tree in your stand and fill it with boiling water within 1.5 / 2 hours!! (If unable, make another new cut!!!) Yes, use boiling water!! The heat at its base will open the tubules allowing more efficient passage of water and your tree will be happier for it!! Keep your tree stand filled with water because a seal of dried sap will form over the cut stump within 2 hours if the water drops below the base of the tree—effectively preventing further water up take. Within the first 24 hours your tree may ‘drink’ as much as four liters!! You will also want to keep your tree away from any heat source such as a fireplace, a radiator, a furnace duct outlet, or a television set—which all increase the risk of dehydration and or combustion! Check your ‘Christmas Tree Light’ cords and connections too, and make sure they are in a ‘safe’ condition! Also, unplug your tree lights before leaving the house or retiring for the night—and never overload your electrical circuits!! Simple precautions such as these will help preserve the freshness, the beauty, the fragrance, and the tradition that only a real 'Christmas Tree' can provide!! 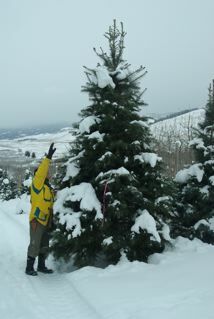 We carry and sell the best ‘Christmas Tree Stand’ on the market! No more screws to tighten!! No parts to bend or brake!! No more fighting to keep your tree up and straight with guy lines!! It’s a ‘Lifetime Stand'! Strong! Simple! And it works!!! Sells for only $35.00 (supports up to 8’ tree). Larger stands (same design) also available and hold up to 15’ tree. Once you have this stand, you will never want or need another one!!! (See Don Burnett's kind letter under 'Testimonials'). We have several thousand trees in our plantation for you to choose from and they include the following species. Bring the Kids (See Video)! Bring the kids and make it a fun filled family outing. Enjoy a ride on our hay wagon-which we pull behind a Honda quad. The kids love it and it makes for a great ‘photo op’--especially with grandpa or grandma or mom & dad in the wagon with them!! We have a big fire pit, keep a good fire burning and serve a hot drink for your comfort and pleasure (included free), while our staff shakes your tree to rid it of weeds, bird nests, loose needles, etc. Then, (also included) we pull it through our ‘Tree Baler’ to make it easy to load and bring in doors without knocking the pictures off your wall or scratching the paint!! We’ll help u load it on your vehicle too, and for a reasonable fee (depending upon where u live), we will even deliver to your residence at the close of our day!! Monday @ 11am. Until dark. Tuesday @ 11am. Until dark. Wednesday @ 11am. Until dark. Thursday @ 11am. Until dark.